The year was 1975 and the Australian film industry found itself knee deep in it's incredible exploitation cycle (Ozzploitation as it has since been dubbed). The current craze for Hong Kong action cinema had reached it's peak and the Aussies were anxious to attempt a hybrid Chinese/Australian action fest. 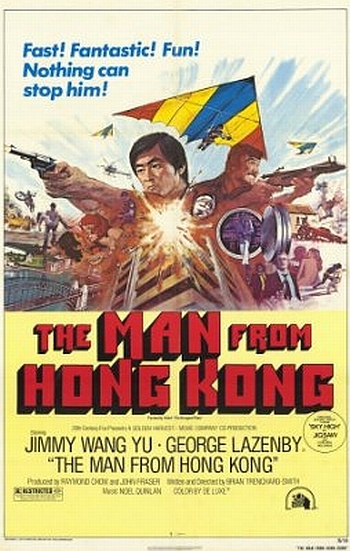 They imported well known, yet somewhat faded Hong Kong star, Jimmy Wang Yu (the most popular action star in Asia prior to Bruce Lee's arrival; hence the fading) to play a Chinese Dirty Harry-like hero and landed failed James Bond, George Lazenby to play the debonair, yet sinister villain. Up and coming British born director Brian Trenchard-Smith (in only his fourth lensed film) was assigned the task of brining the proceedings together. The resulting film was 'The Man From Hong Kong', a fairly amazing collage of heavy hitting martial arts and ahead of their time stuntwork. A lot of credit has to be given to director Trenchard-Smith for holding everything together. By the crews' own admission, they were not familiar with stuntwork and if the incredible car chase sequence (which can rank alongside the best that Hollywood was offering) looks awkward and dangerous, it's because it is. Filmed essentially guerilla style, it has a genuine, "let's figure it out as we go along" feel that is still thrilling to watch even now. For his part, Lazenby (who does an admirable job in this film) actually agreed to allow himself to be set on fire during the feverish finale, shocking the Hong Kong crew (who most likely remembered this when they started to utilize the stunt a decade later, particularly one Ring Lam who did likewise to Karl Maka in 'Aces Go Places 4' and even superster Chow Yun Fat got the flame treatment in the highly recommended, 'Wild Search'). But despite all of this, the most dangerous aspect of all was attempting to deal with imported star Jimmy Wang Yu. For reasons not made clear (which is probably a good thing), Jimmy set about making life miserable for the entire Aussie cast and crew. Though his star may have fallen a bit, Wang Yu was still a major player in Hong Kong cinema and was not used to taking orders from others (he was/is apparently well connected... if you get my drift) and vented whatever anger and disgust he had on his collaborators from Down Under. It reportedly got so bad, that there was mention of getting rid of him; from the film and perhaps more. But Trenchard-Smith (who himself bore much of the physical brunt) stuck to his guns and saw the whole uncomfortable process through. He took his lumps with Jimmy, but got exacted his revenge at the box office where the film was a big hit, both in Austrailia and in Hong Kong. Complete with excellent fight choreography from a pre-superstar Sammo Hung (who also lands a cameo in the pic), 'The Man From Hong Kong' though slow in it's first half, rewards action fans in it's final reels with some of the more breathtaking moments to be found in '70s cinema. An 'Ozzploitation' cheese classic if ever there was one.